How is the SSPX prepared to accept the Second Vatican Council??? - Reblogged and Updated. 2) Any ambiguous texts of Vatican II must be interpreted strictly according to Tradition; according to the consistent teaching of the Church throughout the centuries. 3) Anything in the Council that cannot be interpreted according to Tradition should be revised. The Archbishop laid this out explicitly in his letters to Cardinal Ratzinger in 1982 and 1985. A few years ago Tony La Rosa (aka ecclesia militans a Toronto based 'resistor') had a difficult time accepting this approach to the council. He held that it must be completely tossed aside. I maintained that it was one option, however a correction was also possible. If I remember correctly, he had a great deal of difficulty setting aside his dogmatic opinions and realizing that the way we would solve the crisis does not constrain how God WILL solve the crisis. 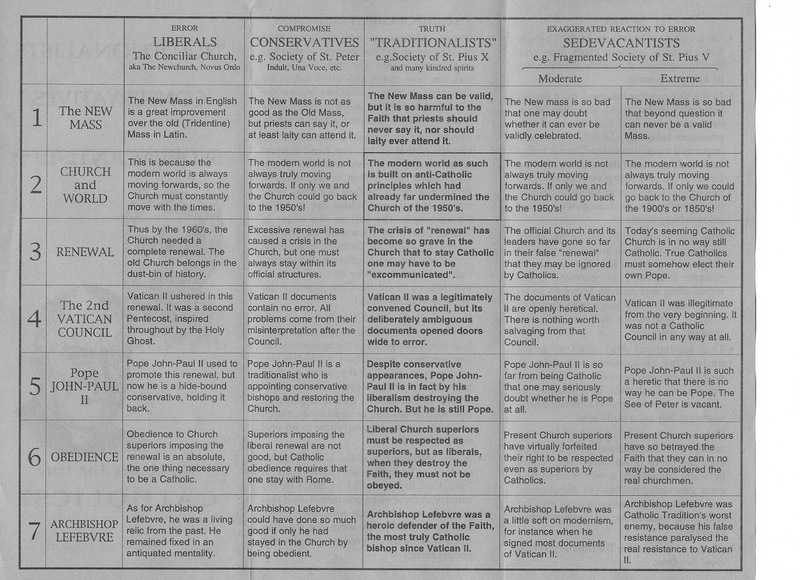 You'll notice that the opinion that "nothing is worth salvaging from the Council" is listed (By Bishop Williamson) as being a moderately sedevacantist position. Update: Mr. John Vennari has given me permission to reproduce the articles of CFNEWS. This article is particularly important as it outlines the principles followed by Archbishop Lefebvre in assessing the teachings of the Second Vatican Council. Pope Benedict XVI’s withdrawal of the alleged “excommunications” is good news for the entire Catholic world. Perhaps the cause for greatest rejoicing is that the “excommunications” were lifted without the Society of St. Pius X compromising the Faith one inch; without compromising their principles and their open resistance to the Council and its disastrous liberal reforms. Long may this steadfast refusal to compromise continue. Both Bishop Bernard Fellay, Superior General of the Society of St. Pius X, and Bishop Tissier de Mallerais, SSPX, stated that next on the program is doctrinal discussion regarding Vatican II and the crisis in the Church. Bishop Fellay always refrained from using the word “negotiations” in this regard, since, “there is nothing to negotiate. You can not negotiate the faith”. Likewise, Bishop Tissier de Malleriais noted in a February 1 interview, “There will be doctrinal theological discussions regarding doctrines of the Second Vatican Council between the delegates of the Holy See and us … We do not change our positions, but we have the intention of converting Rome [to our positions], that is, to lead Rome towards our positions." 3) The search for the most adequate canonical solution after the doctrinal questions are resolved. The motu proprio freeing the Old Mass and the January 21 lifting of the “excommunications” fulfills the first of the three-point outline. The SSPX now appears headed toward a stage in the proceedings that will be fraught with interest: the doctrinal discussion regarding Vatican II. “Considering that the Declaration of Religious Liberty is contrary to the Magisterium of the Church, we ask for a wholesale revision of the text. “We consider likewise indispensable noteworthy revisions of documents like ‘The Church in the Modern World’, ‘Non-Christian Religions’, ‘Ecumenism’, and clarifications of numerous texts presently tending toward confusion. There is another important historic fact often buried that should be brought back to the surface. In the 1980s, as the disorientation of the Church was accelerating due to an increased application of the most radical aspects of the Council, Archbishop Lefebvre prayed for a sign from Providence whether or not to consecrate bishops for the SSPX. He explained he received two signs that it was necessary to proceed. The first was Pope John Paul II’s prayer meeting at Assisi. The second was a doctrinal response from Cardinal Ratzinger’s office that Archbishop Lefebvre considered even more serious than Assisi. As for the first: Pope John Paul II’s held the first interreligious prayer meeting at Assisi in 1986, wherein Protestants, Orthodox, Jews, Muslims, Hindus, Shintos, Jains, and various pagan religions gathered in Assisi to pray for peace, according to the rituals of their own heretical or pagan practices. The “second providential sign” that Archbishop saw was in the 1987 reply Cardinal Ratzinger’s office gave to Archbishop Lefebvre’s formal theological objections to the Council document on Religious Liberty. It is also well-known that the eminent theologian Msgr. Joseph Clifford Fenton, Editor of the American Ecclesiastical Review and true expert on the doctrine of the Social Kingship of Jesus Christ, had been a peritus at Vatican II. He left the Council and resigned from the American Ecclesiastical Review rather than accept the new direction of Religious Liberty. As Michael Davies often noted in this regard, “Yesterday’s heresy had become today’s orthodoxy”. 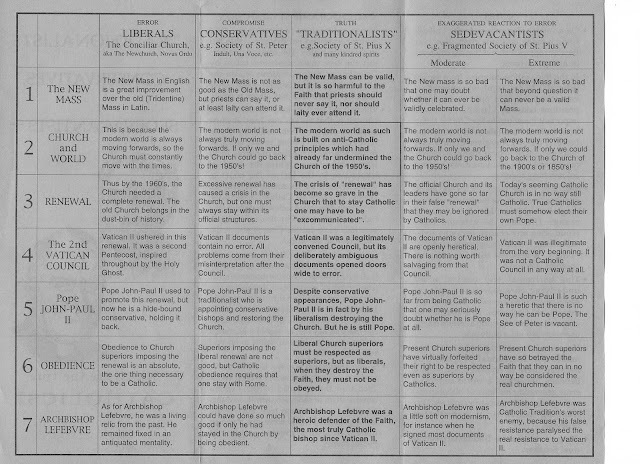 In October 1985, Archbishop Lefebvre submitted to the Sacred Congregation for the Doctrine of the Faith a document that contained thirty-nine doubts (dubia) concerning incongruities between Vatican II’s new doctrine on Religious Liberty and the consistent teaching of the Church from the past. Rome replied to the Archbishop Lefebvre’s Dubia with a fifty-page document that considered none of the doubts in particular. Cardinal Ratzinger’s office admitted that Vatican II’s doctrine of religious liberty was “inconstestably a novelty”, but claimed it was the outcome of “doctrinal development of continuity,” whatever that means. To detail Religious Liberty’s effective overthrowing of the Church’s perennial magisterium on the Social Kingship of Jesus Christ is beyond the scope of this short article. Suffice to say that the Vatican’s response – which was, in effect, a principled adherence to the new doctrine – shook Archbishop Lefebvre to the bone. Archbishop Lefebvre saw Rome’s reply to the Dubia as “the sign that I was waiting for, a more serious sign than Assisi. For it is one thing to perform a serious and scandalous act, but quite another thing to affirm false principles that in practice have disastrous consequences”, which is the practical overturning of the Social Kingship of Our Lord Jesus Christ and the “pantheon of all religions”. The Society of St. Pius X credits Pope Benedict XVI for the motu proprio, and for the lifting of the “excommunications”. Indeed it is probably true that no other cardinal elected to the Papacy in 2005 would have both freed the old Mass and removed the unjust stigma laid upon the SSPX bishops. But the SSPX primarily credits Our Blessed Mother. The Society organized two Rosary Crusades to which SSPX supporters worldwide responded with generous enthusiasm. Two and a half million Rosaries were prayed in the first Rosary Crusade for the freeing of the Tridentine Mass. In the second, SSPX supporters offered one million, seven-hundred-three thousand Rosaries in less than two months. These are impressive numbers for those who are a minority in the Church. He urged his people to keep up the fight for Catholic Tradition, to arm themselves with the truths of the Faith and the writings of the pre-Conciliar popes, noting that we may be entering a more difficult and confusing battle. He also urged his people to pray hard for Superior General Bishop Fellay, as he carries all 500 SSPX priests on his back, and the devil will pull out all the stops to try to make him stumble. I am sure all of our readers will offer many prayers for Pope Benedict XVI who is taking his share of hits for his positive moves toward the Society. I am also confident our readers will offer numerous prayers, especially the Holy Rosary, for Bishop Bernard Fellay, and all bishops, priests and religious of the SSPX as they strive to maintain unswerving fidelity to the perennial magisterium and to the wise counsel of their founder, the late Archbishop Marcel Lefebvre.